West Pacific Electric completed the installation of the AT&T and Frontier telecommunication infrastructure for the facilities located at S Peach Ave, E. Elkhorn Ave, 9th Ave., Cairo Ave. The work consisted of installing vaults, casing and conduit via trenching, and HDD installation and included all bedding, backfill, AC paving, and traffic control in accordance with MUTCD guidelines. Installed all conduits to the base of nearest pole for connection and running of the cables by AT&T & Frontier. Ran 1#10 AWG Bare Tracer wire in each of the duct banks for traceability of the conduit system. West Pacific Electric was hired by Tachi Palace Hotel and Casino to design and build and new dual feed, 15KV double stacked for future loop feed electrical switchyard substation gear lineup, 15KV primary feeder system with manholes, 15KV distribution system. The following scope included, but not limited to: demolition of existing obsolete dual feed 15KV single stacked cubical switchyard gear lineup, primary feeder cable, 15KV VFI Interrupter at the source (PG&E), existing 125VDC battery bank system. Outage coordination during the switchgear change out required weeks of preparation, coordination with the facility managers, security enforcement, life safety officer, maintenance supervisor, central plant supervisor and PG&E. The project included fur shining all hardware, software, programming, installation, screen configuration, labor, material equipment in strict compliance with the contract documents for expansion of the real time SCADA system at Porterville Developmental Center (PDC). The purpose of SCADA expansion was to allow automatic and remote control of the facility’s irrigation system. WPEC provided expansion system components completed with the system integration and connection to all existing input/output devices, telemetry system, processors, control panels, computer software, programming and field devices. West Pacific Electric Company pulled wire from building 3 to Runway 32R, trouble shot lighting circuit A, tested wire and documented all findings for each manhole, evaluated all connections, cleaned and re-lubed, changed-out bad wire as required and tested and confirmed lights on runway were back in service. All work was performed during emergency working hours. This project as NAS Lemoore was an emergency project. The ability to have our management team to respond quickly and effectively while utilizing a crew of 25 journeymen was critical to the project. 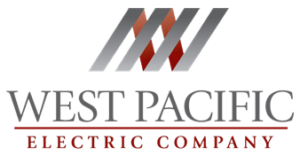 West Pacific Electric completed all site lighting, power and relocation of existing power, service and communications in its current state. WPEC upgraded to the existing system beyond the relocation/reconfiguration of the system necessary to complete the work specific to the Tachi Hotel & Casino requirements. Pulled wire from the new Christie box location to substation pad for well pump. Pulled secondary wire from transformer to switch gear. Pulled wire from the main switchgear to lighting cabinet. Trenched around substation, rerouted 1″ and 1 1/4 PVC conduits to the new christie box location. Back filled trenches and placed burial tape. The project included the installation of new parallel 5″ PVC concrete encased duct bank, utility vaults along with racking and fire taping of new and existing feeders for new 12KV incoming feeders. Replacement of 12KV feeder from interrupter switch to 12KV distribution gear utilizing new utility vaults. Drilling to existing 12KV breaker cubicle sections and routing new duct banks out each breaker section cubicle to new 10’x10’hx 101 utility vaults for future loop system.